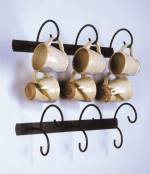 Sturdy, yet elegant, this six place mug tree is the perfect solution for organizing accessing your favorite tea cups, or coffee and beer mugs, especially if you don't have a lot of wall space to spare. Rack features a solid black, powder coated surface and is 34" tall. Hooks extend 6 1/2". The perfect way to add a little flair to the breakfast nook or kitchen wall!